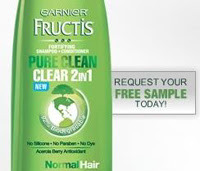 Request a free sample of Garnier Fructis Pure Clean Clear 2in1 Shampoo + Conditioner. On the Garnier USA Facebook page just click on the provided link. Allow 4-6 weeks for delivery.